GBPUSD is under the influence of Obama’s comments regarding the GBP and UK’s CBI industrial trends reports. GBPUSD touched 1.45220 yesterday and had a slight decline today morning. Creating the resistance in 1.45220 area, it seems that this pair is going to move within the ascendant channel for now. The pair is finding support at 1.44750 with resistance at 1.45220 which both lines are above the weekly pivot point at 1.43270. The MACD indicator is in positive territory showing the price growth and the EMA of 10 is located above the EMA of 50 which shows the bullish tendency of the chart over the last recent days. The RSI is above the 50 level and the ADX is showing stronger buyers. 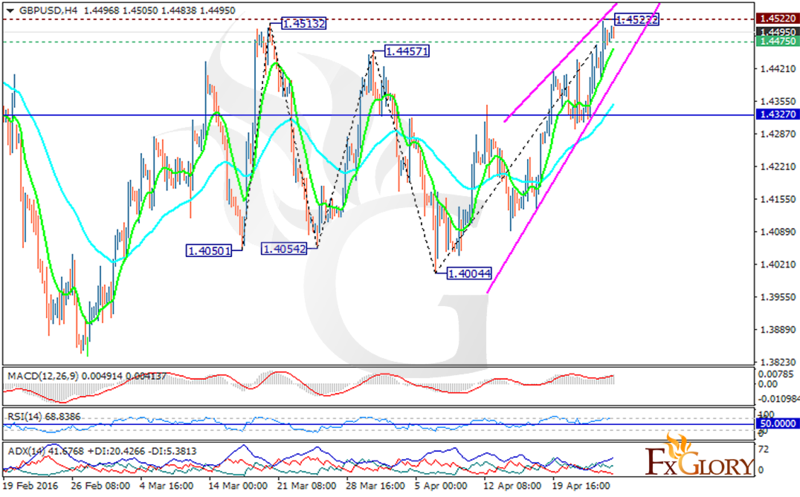 Long positions are recommended with the target at 1.4560.